Well, it's been a pretty productive week, even with the hubby home the first half of it. I love when he is home of course, but definitely don't get as much done. 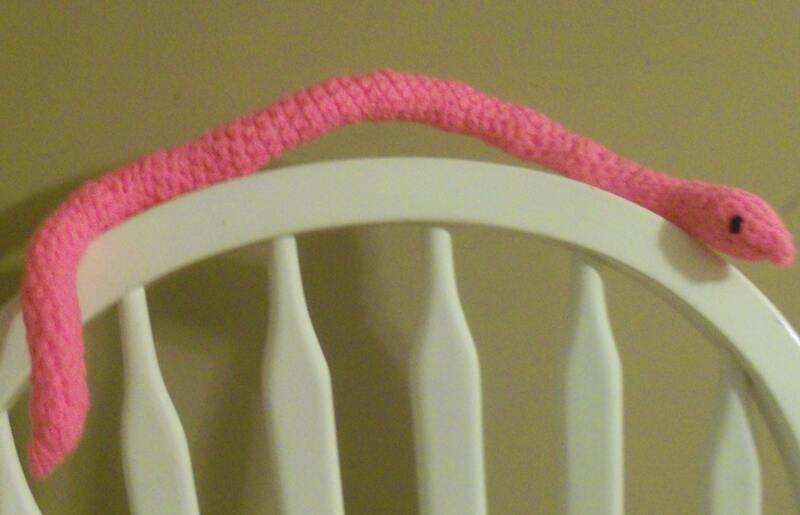 I finished the heart towel and found and listed a pink crochet snake that I had made for a relative that changed her mind on color. I have squares cut and ready to make a spring bag for a friend. You can see the cut out squares here. Another friend reminded me about making animal shaped potholders and I found these cute squares so we'll see what I come up with. You can see pictures here. Finally, I may be making a bag for my aunt; hoping she can find the perfect fabric for the project! With the spring bag, I was able to stick to using what I had on hand and am happy with the color and design combo. I am not sure what I am going to do for the handles and lining yet, but I'll decide after I have made the outer shell. My aunt originally wanted to use a birdhouse fabric I had from Fabric Central's Aerie bundle for the bag. Unfortunately, I did not have near enough of it and it is no longer carried at Joann's. I am really bummed they do not sell that line anymore because it was such a pretty group of fabrics, and it could have been used in so many projects. You can see my scraps from the bird fabric here. Anyway, I have had a pretty good week with the kids. They have still been adjusting to being back at home and getting into our very loose routines. With all of their new toys, they have been bouncing from area to area and toy to toy-generally being messier. So, we are working on remembering to clean up again. My older one got a good deal of Playmobil and that has kept both of them pretty busy. He also got some starter science kits-a fizzy foamy one and a color mixing/crystal growing set. We did the fizzy foamy set the other day. The kit has about 7 different activities and I jumped right to the volcano one. It hardly bubbled up so I tried the activity labeled "More eruptions". That one bubbled up more but neither really fizzed up and spilled over so while the kids thought it was cool, I was a little disappointed. Looking at the other activities, I realize that I probably should have done them in order because it goes through acids and bases and what makes it fizz and all that. But, at the same time, I feel all of that information would be lost on a 4 yr old and 2 yr old. The ingredients are basic and are all kitchen friendly-vegetable oil, baking soda, citric acid, etc. So, even if I run out of something from the kit, I can easily replace it. We haven't tried the color mixing/crystal growing set yet-hopefully today or tomorrow. I have been struggling with how to structure their day and at times I have even tried to plan activities and lessons for them because I worry about them missing out on learning while being home. But, I have come to realize (which I already somewhat knew and just needed to accept) that they will learn just fine through playing and experiencing each day. My mom did not plan out activities and lessons for my brother and me and I do not think either one of us went to preschool and we did pretty well in school. Right now, my boys just need me to play with them and enhance their play experiences. They usually help me bake and I hear my 2 yr old saying he needs a teaspoon while playing in the tub. We count while playing games and lining up cars; we find shapes and colors all around us. If my 4 yr old draws a picture of a fish or cave, I have him write the word on the paper. Seeing what my boys are capable of doing, reassures me that they are on the right track. For those that do more structured days with their young children-I admire you and appreciate all of the hard work you put into it. For me, my day just gets away too quickly and when I plan activities they almost never go the way I planned. So, I let them decide how they want to sped each moment of their day (within reason) and try to enhance it. They both have Mobigo's which is a game system for children 3 yearsto about 7 years. The cartridges are well known tv and movie characters, except the generic one that comes with it. The games help them with shapes, colors, math, letter and word recognition, etc. Every game has an educational purpose. The boys do not play them every day and when they do, it is not for hours on end, but I think it is a fun way for them to learn the basic skills while giving them some quiet time. Anyway, enough rambling...Hope you have a great Friday and weekend! Sounds like you've been rather busy! The animal potholders sound cute! Sounds like you have your hands full! 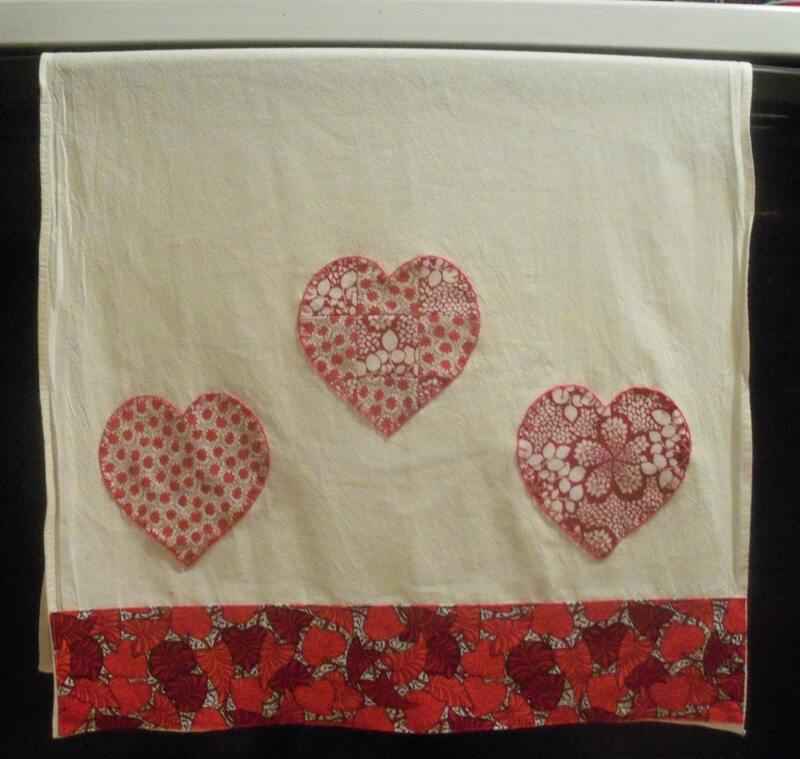 :) Very cute heart towel!